Armenia has always attracted travelers with its singular picturesque places. In the ancient churches and castles, mountainous lakes and rivers, majestic cliffs, vertiginous canyons are hidden thousands of stories and many mysteries. To the north from the capital city of Armenia is situated Kotayk Marz (Province) with its administrative center Hrazdan. The name of the Marz with its roots dates back to antiquity, during the time of the patriarch Kot. The average temperature of Kotayk is +19 C in summer and -19C in the winter. The third of the territory is covered by forests. Overall territory of the province flows the river Hrazdan. In the eastern part near the Geghama Mountains there are several volcanoes. Attractive resort town Arzni, famous for its therapeutic mineral water “Arzni”, is situated in the picturesque Hrazdan canyon. In recent times, the health spas and treatment centers of Arzni have earned attention as destinations for cardio-vascular treatment. 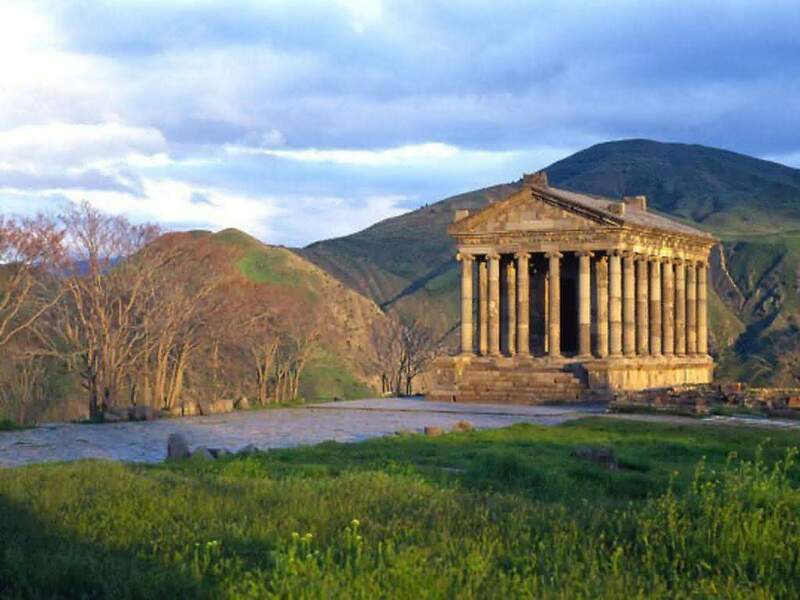 It is interesting to go on an excursion to Garni, ancient Armenian village, summer residence of Armenian kings of the III century BC – the Temple of Sun. Garni temple represents Armenia’s Hellenistic culture influence in II-I centuries BC. Garni is famous for lavash (Armenian, thin pita bread), feta cheese, yogurt, young wine, apples, walnuts, hazelnuts and almonds. 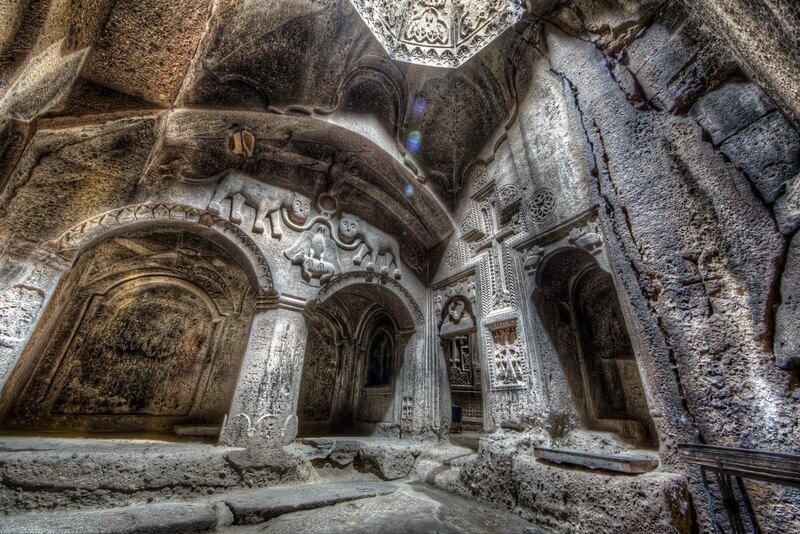 Geghard monastery complex of the XII-XIII centuries dug in the cliff, is the place, where the historian Mkhitar Ayrivanetsi (XIII cent.) worked. Geghard, or more fully Geghardavank, meaning “the Monastery of the Spear”, originates from the spear, which had wounded Jesus at the Crucifixion, allegedly brought to Armenia by Apostle Jude, Thaddeus, and stored amongst many other relics. Now it is displayed in the Echmiadzin treasury. If you walk up a path near monastery, you will see a few vendors of souvenirs and snacks. Try the sweet “sujukh”, sweet lavash and gata if you have never tasted them before). Bizarre cliffs, caves and waterfalls. 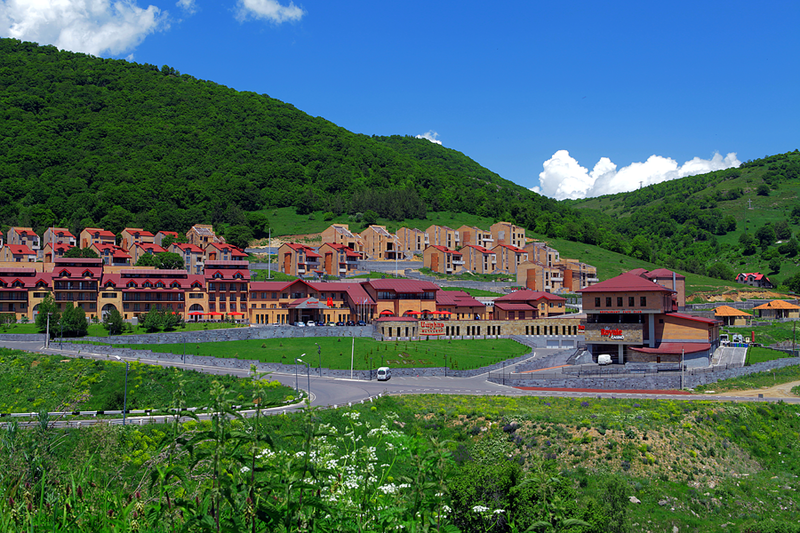 Dilijan is situated in Tavush Marz in the northern part of Armenia. Rocky mountainous slopes and deep gorges are typical of this area. Most of the territory is situated at an altitude of 800-1000m above sea level. Landscapes are stunning with their beauty. The beautiful virgin forests are on slopes of mountains at an altitude of 600-2900m above sea level, where it grows over 120 species of trees: beech, oak, pine, etc. Reaching the highest peaks of the mountains, the forests turn to alpine meadows. Attractions of Dilijan are Lake Parz, Hermitage Museum, Haghardzin Monastery, Goshavank Monastery, Jukhtak Monastery, Matosavank Monastery. Vayots Dzor is one of the southern provinces of Armenia. Mountain ranges, deep canyons, and ditches occupy most of the territory. Jermuk is a small resort town in the Marz of favorable climatic conditions and one of the main tourist destinations in Armenia. Here, it is cool in summer and is moderately cold in winter. Forests and alpine meadows surround the city and it is at an altitude of 2080m above sea level, on the bank of the river Arpa. Tourists can enjoy the waterfalls, the curing water pools, hotels and health spas, sanatoriums, the ropeway and alpine sports facilities. The town hosts FIDE Grand Prix of chess tournament annually, during the month of August. 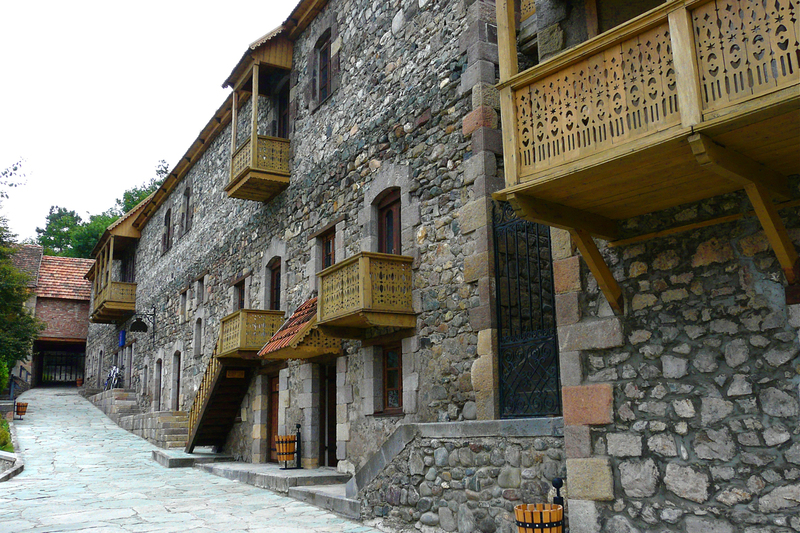 The word “Jermuk” comes from the Armenian word “jerm”, which means warm. 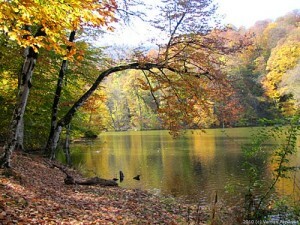 Chemical and physical composition of mineral water “Jermuk” is as known as “Zheleznovodsk” and “Isti-Su”, Karlovy Vary. This underground geyser warm (45 degrees at the source) water is used for drinking, bathing, treatment of stomach and intestine, also gastroenteritis, abdominal, renal and neurological diseases. Sevan is located in Gegharkunik Marz in the eastern part of Armenia, 1500-1900m above sea level. Average temperature in winter is -9C, in the summer +17-29C. 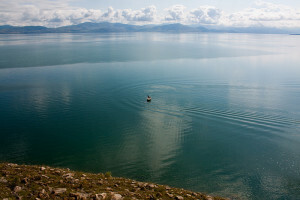 Lake Sevan, the emerald of Armenia, is the largest lake in the Caucasus and the most freshwater lake in the world, which is of volcanic formation. 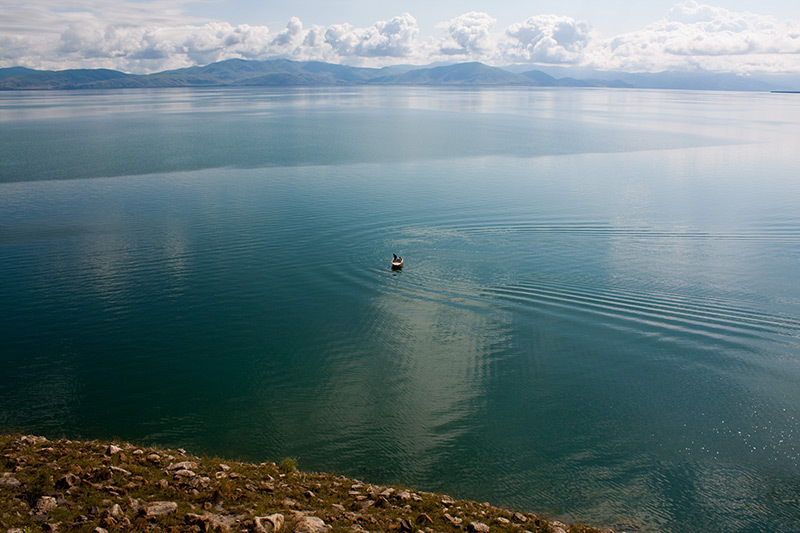 Lake Sevan attracts tourists with its divine beauty and magical powers. Sevan is also famous for its fish, especially trout, which the Armenians call “ishkhan” (which means “prince”). The island (now peninsula) with the Monastery of the 7th century is one of the mysteries of nature. 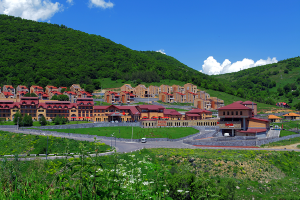 Resort town Tsakhkadzor is located in the beautiful canyon of Tsaghkunyats mountains, among the pristine forests and alpine meadows, which were places of hunting for the Armenian Kings Arshakuni in the ancient times. It is a popular health resort. During the recent years, the ski resort was fully modernized.